SAN FRANCISCO — Last week’s campus protest, following a verdict that handed three White, former San Jose State University (SJSU) students reduced jail sentences for what many perceived to be a hate crime, has put new pressure on administrators to hire a chief diversity officer to handle festering racial tensions at the Bay Area college. The high-profile case of racial bullying and abuse of a Black freshman, Donald Williams Jr., in 2013, put a spotlight on the mistreatment and harassment many minority students say they feel on an ongoing basis at SJSU — a school of 33,000 where only 3 percent of the student body is African-American. But on March 14, hate crime charges were formally dropped against the 20-year-old defendants, Colin Warren and Logan Beaschler, who were found guilty of misdemeanor battery and sentenced to one month in jail or weekend work. A dormmate, Joseph “Brett” Bomgardner, 21, received a one-day jail sentence and credit for time served. All three men must complete 50 hours of volunteer work and enroll in a sensitivity class about African-American history and culture. When the news was announced, anger erupted on the SJSU campus. Last Thursday, more than 100 students, many of them wearing “Black Lives Matter” T-shirts, gathered to protest what they called a grossly unjust decision. “We’re all outraged about the verdict. We thought we were going to get the justice that we deserved,” Donntay Moore-Thomas, an organizer with the Black Unity Group, told Diverse. Her group, which is part of the Black Student Union, was joined by members of the National Pan-Hellenic Council, African American Society of Mentors and MEChA, the Chicano student movement, among others. When the revelations of Williams’s abuse became public, they ignited outrage in the community and forced an internal investigation at SJSU, as well as an apology from the school’s president. They also led to the establishment of a Special Task Force on Racial Discrimination, in 2014, which provided more than 50 recommendations including the creation of the Office of Diversity and Inclusive Excellence, the implementation of a campus climate survey, and regular diversity forums. The President’s Commission on Diversity examined steps being taken at 90 colleges and universities nationwide to help reach its conclusions. 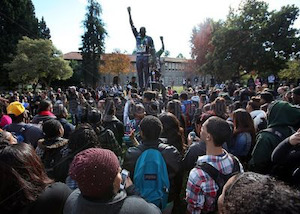 SJSU’s interim President Susan Martin also issued a statement decrying the court’s decision. “While we respect the independence and discretion of jurors and the courts in reaching these determinations, the offenders’ conduct was unacceptable and incompatible with our values. They are no longer enrolled at SJSU,” she said. Now the university is under pressure to select a chief diversity officer who can quell the rising discord, a process that is facing increased scrutiny. Open forums presenting candidates for the position began Friday and continue through this week. The finalists include Emelyn de la Peña, assistant dean of student life for equity, diversity and inclusion, at Harvard College; Jacqueline Hughes, co-chief diversity officer and associate provost of academic personnel at CSU San Bernardino; Kathleen Wong, director of the Southwest Center of Human Relations Studies and the National Conference on Race and Ethnicity in Higher Education (NCORE), at the University of Oklahoma; and Rickey Hall, vice chancellor for diversity and inclusion at The University of Tennessee. “The chief diversity officer search is tremendously important to SJSU,” Pat Harris, the university’s media relations director, told Diverse. The eight-person search committee includes Julia Curry, a Mexican American studies associate professor; Hyon Chu Yi-Baker, director of the MOSAIC Cross-Cultural Center, and two SJSU students, one of whom, Joshua Romero, is the vice president of associated students. Meanwhile, Moore-Thomas and her colleagues have threatened renewed protests and “direct action” if more aggressive efforts aren’t made to combat racial tensions at the school.